12/02/2018 - The Hershey Bears scored early and often on CommunityAid & WGAL Teddy Bear Toss Night in a thrilling in 6-3 win over the Binghamton Devils on Sunday night. 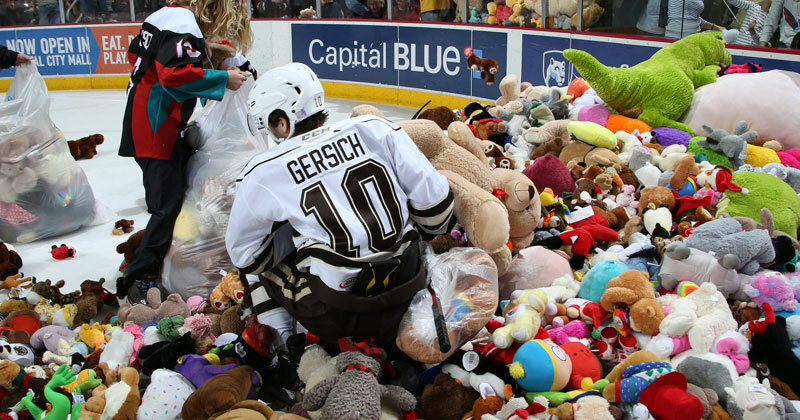 Riley Barber's first period goal sent Giant Center into a teddy bear toss frenzy, leading to 34,798 stuffed animals collected. Donated items will be provided to over 30 local charities across Central Pennsylvania. This surpasses the team's record of 25,017 collected in 2017, and the world record of 28,815, previously set by the Western Hockey League's Calgary Hitmen in 2015. After the Devils struck first on a goal by Nathan Bastian at 9:08, Barber unleashed the teddy bears only 50 seconds later in front of a crowd of 10,046. After Mike Sgarbossa hit the cross-bar on a power play chance, Barber potted the rebound to even the score. Following the lengthy teddy bear cleanup on ice, the Chocolate and White possessed the momentum for the remainder of the first period. At 11:16, Shane Gersich scored unassisted to provide Hershey a 2-1 lead prior to intermission. Shots after 20 minutes were tied 15-15. Both team's traded goals in the second period, but it was a late deflection by Nathan Walker with 1.7 seconds left on the game clock that gave Hershey a 3-2 lead at second intermission. The Bears out scored the opposition 3-1 in the third period to cruise to a 6-3 win. Liam O'Brien scored at 3:42 and eventually added an empty net goal at 17:26 to round out the scoring. On O'Brien's first goal, Jake Linhart earned the primary helper for his first career AHL point. After Marian Studenic scored for Binghamton at 9:04 to pull the Devils within 4-3, Aaron Ness responded with a key insurance marker at 10:22. The Bears finished the night 4-for-5 on the power play and a perfect 5-for-5 on the penalty kill. Final shots on goal were 35-32 Hershey. The Hershey Bears return to the ice on Friday, December 7 against the Lehigh Valley Phantoms at PPL Center. Puck drop is scheduled for 7:05 p.m. Voice of the Bears Zack Fisch will have the call on the Bears Radio Network.